Immerse yourself in the natural beauty and history of the Mekong River while travelling in 5-star style onboard the Mekong Jewel. Launching in 2020, this cruiser promises the experience of authentic cultural immersion in total luxury with impeccable service. While aboard the Mekong Jewel, the comfort of each guest is paramount. Every detail has been hand-picked, from the furnishings to the guided excursions, to satisfy a range of sophisticated tastes. 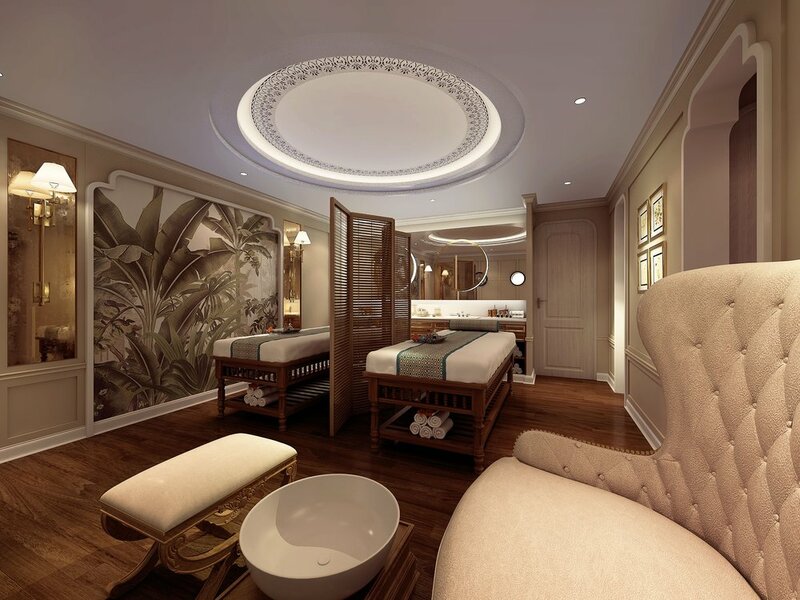 The Mekong Jewel features a jet pool, an infrared sauna, a fitness centre and our restful Cochinchine Spa. Even your choice of dining experiences will take you out of the ordinary. 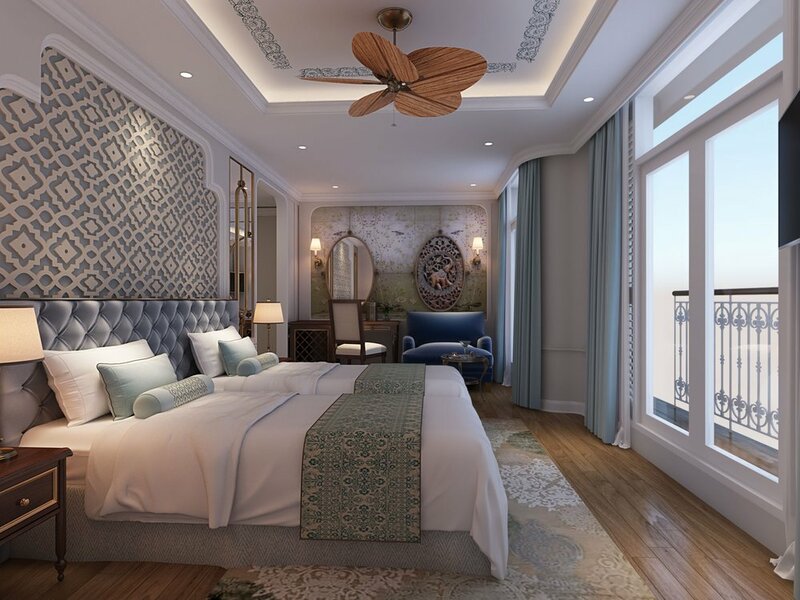 The Mekong Jewel embodies the atmosphere of an elite boutique hotel while floating serenely down the legendary Mekong. The experience onboard includes exquisitely professional service, all the excursions, meals, laundry facilities and gratuities. Take in the sunset and the cool breeze along the Mekong while connecting to the local traditions and authentic flavours of this breath-taking destination. Like a classic jewellery box, which unlocks to reveal its most precious interior, the Mekong Jewel’s suites shine with chic refinement in total privacy. The door to each suite opens into a lavish space with high ceilings and hand-picked décor, epitomising the soft lines and rich tones of the French Indochine era. The faultless attention to detail from the luxurious bath amenities to the mini bar and glass water carafe that are restocked daily showcase the Mekong Jewel’s world-class service. Slip on the velvety soft spa robe, sink down into the bed after choosing the perfect pillow from the pillow menu and marvel at the exquisite new home away from home. There are four categories of suites ranging between 85 square metres to 30 square metres. Each suite features a luxury marble bathroom with rainfall shower, writing desk, hair dryer, flat screen LCD television with news, sports, movies and infotainment channels and minibar restocked daily. The Grande Suite and the Prestige Suite include a daily butler service. Grande Suite: Travel in utmost comfort in the largest suite currently sailing on the Mekong River. The Grande Suite features a spacious 915 sqft (85 sqm) and a panoramic veranda, perfect for sipping wine in privacy and taking in the sunset. Watch the light change through the floor-to-ceiling glass windows. The decor in the room is inspired by the glamorous tropical refinement of Southeast Asia in the 1930s with all the modern luxuries you might require, from top-shelf selections in the minibar to designer bath products in the marble spa bathroom. Grande Suites are available with one king-size bed. Signature Suite: With the option of two twin-size beds or one queen-size bed, the Signature Suite layout can be customised for the guests’ needs. The space in the 333 sqft (31 sqm) suite becomes even more generous when including the private balcony. Enjoy breakfast in the spacious seating area or choose a nightcap from the fully-stocked minibar while taking in the panoramic view through the floor-to-ceiling glass doors. 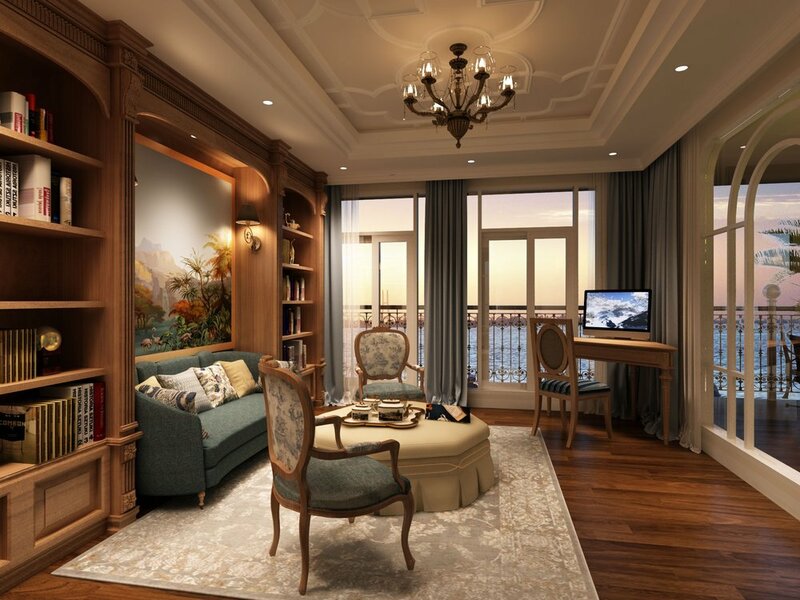 Prestige Suite: The Mekong Jewel’s Prestige Suite provides guests with an airy 548 sqft (51 sqm) of comfort. The private balcony with floor-to-ceiling French glass doors flood the room with natural light and highlight the beauty of the hand-picked furnishings. The expansive marble bathroom and rainfall shower are made for relaxing, while a private butler will make sure all needs are met on a daily basis. Prestige Suites are available with one king-size bed. Vista Suite: Vista Suites provide guests with a comfortable 323 sqft (30 sqm) of living space with ample light through the floor-to-ceiling French doors. Enjoy the serene landscapes with a hot cup of specialty coffee as the sun rises over your private balcony. The Vista Suite is available with one queen-size or two twin beds. Mekong Jewel offers a wide variety of stunning venues to enjoy during the cruise. The choice of dining experiences will take guests out of the ordinary. From the glass-walled Opal al fresco restaurant to the truly panoramic view at the Jade Spirit Sky Lounge and the expansive buffets offered at The Emerald Dining Hall, every meal will become a memory. Prefer a good book? Head to our Topaz Library and let the tales of ancient Indochina spirit you away as you unwind with a complimentary drink on the sun deck. The Emerald Dining Hall: From the sumptuous breakfast and lunch buffets to elegant plated themed dinners, the talented chefs in The Emerald Dining Hall will prepare mouthwatering international and local dishes that are sure to delight the Mekong Jewel’s discerning guests. The spacious, opulent interior of the restaurant is inspired by the cosmopolitan sophistication and natural beauty of the restaurant’s precious namesake. Opal Alfresco Dining: The Opal Alfresco restaurant features convertible glass walls so that no matter what type of weather is on the horizon guests can still enjoy the feeling of al fresco dining. Relax with friends in the airy and spacious dining room and take in the sunset as you sip on our selection of red and white wines, beer and soft drinks. The chefs will showcase their culinary skills in the open kitchen as they prepare world-class Asian and international fare. Jade Spirit Sky Lounge: Vietnam’s biggest cities are known for their extravagant sky bars but imagine taking the atmosphere, open air and well-crafted cocktails of a Saigon rooftop and enjoying it on the top deck of a luxury cruise liner. The Mekong Jewel’s sophisticated Jade Spirit Sky Lounge marries clean and contemporary design with tropical splendour. The Sapphire Lounge: The Mekong Jewel’s serene indoor lounge is the perfect place to enjoy a moment of calm. Hand-sourced furnishings lend the Sapphire lounge an air of antique elegance, while the comfortable seating invites you to relax and stay awhile. 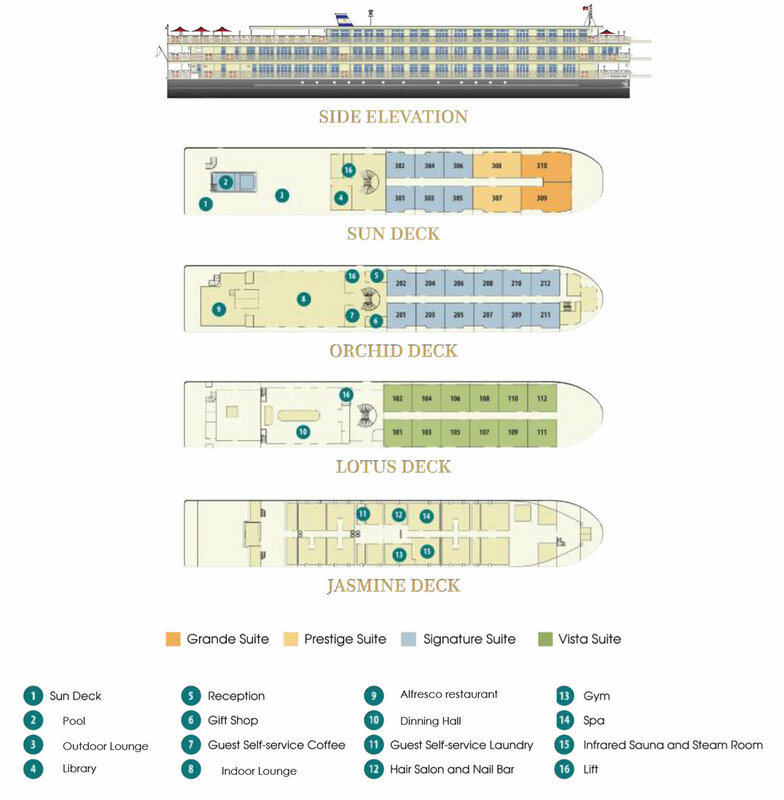 All-day refreshments make this the place a popular spot onboard to meet friends and relax. Topaz library: On board the Mekong Jewel, guests will find a variety of books and magazines that are sure to suit any reading tastes, whether your genre of choice tends towards biographies, business papers or love stories set in French Indochina. Board games are also available for those who prefer a quiet game of chess to an epic novel. The Pearl Wellness: A cruise on the Mekong Jewel can be as active as our guests desire. 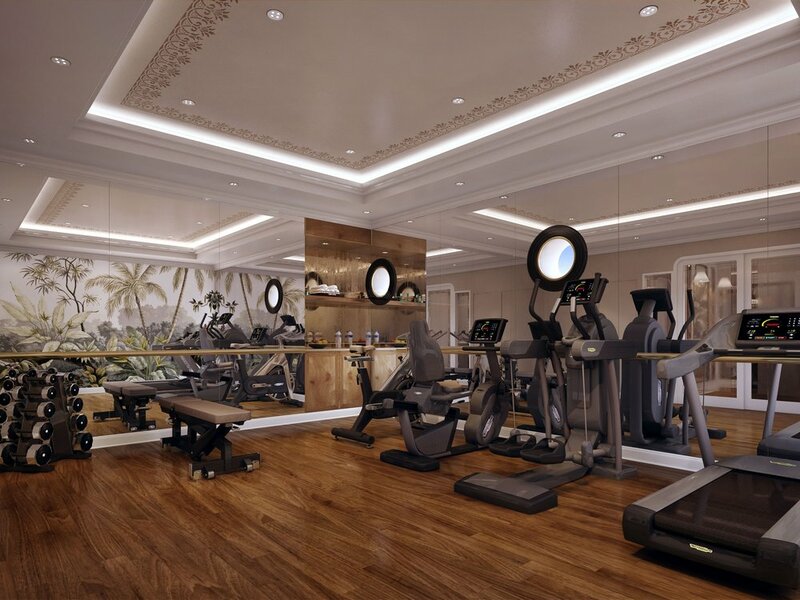 Guests are free to use the Mekong Jewel’s state of the art exercise equipment to maintain ideal fitness levels and to stay active in between walking tours on guided excursions. The Spa: Be pamper with a traditional Vietnamese massage or choose from the menu of international treatments. The skilled therapists can guide guests to find the right massage style for their needs. The spa also offers an infrared sauna. 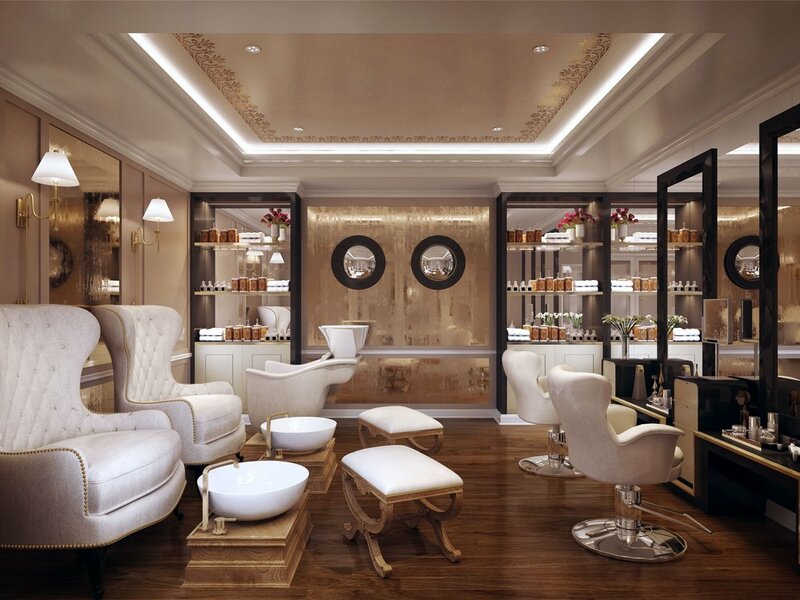 Hair Salon and Nail Bar: The Hair Salon & Nail Bar has been specially created for the guests who love to maintain their beauty standards even while on holiday. Sun Deck and Emerald Pool: Sink into a comfortable chaise lounge, and let the sunshine and bird songs bring blissful relaxation. The Mekong Jewel’s sun deck is the ideal place to catch up on reading, sunbathing or just to have a quiet space to enjoy the landscape in the open air.